If you watched the prelims of the 100 on Saturday morning, you knew that the field was primed for an exciting finish. Defending champion Titus Toms (Burns) and Josh-Lester Harris (J.F. 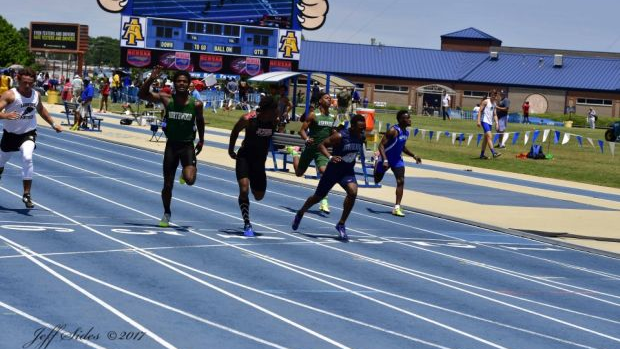 Webb) posted identical 10.80s in the first heat, and Cameron Council (Northwood) was just two-hundredths behind with his 10.82 in heat two to set up a loaded afternoon final. Jason's "Mannn!" as they cross the finish line says it all. Toms and Harris crossed in almost a straight line, with Council just a hair behind in third at 10.70. Toms and Harris were separated by one-hundredth of a second, but it was Toms who came away with the win to defend his title in a 3A best 10.66.